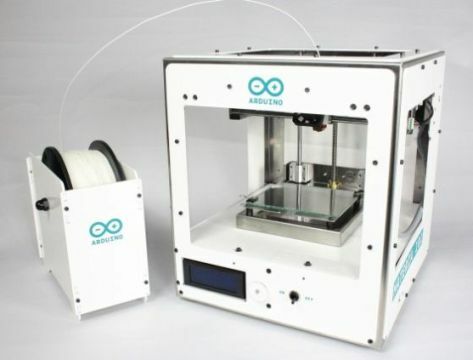 ARDUINO HAS BUILT A 3D PRINTER IN 1000 DOLLARS! Arduino has made ​​life easier for more than a handyman and helped many curious to make their ideas a reality. The firm originally from the most famous open circuit source has revolutionize another domain, 3D printing. 3D printing is clearly the future. However, it is still far from the reach of everyone budget. Society is formal and announced a new goal, “simplify access to the world of 3D printing”. Obviously, it is not the only one on this particularly bearing market, but its skills make it a relevant player that qualified. Backed by its experience, Arduino therefore presents the Arduino Materia 101, created in partnership with Sharebot 3D printer. Competition is not lacking, however, it remains one of the more affordable sector with its price set at $800 in kit. For those who do not wish to risk the assembly, it will be marketed and costs 1,000 dollars being preassembled. It will provide a print area of ​​140 x 100 x 100 mm for the external dimensions of 310 x 330 x 350 mm. Thanks to heritage offered by Arduino for crafts and open source projects, this small should seduce the engineers to the fertile imagination and enable them to realize the wildest concepts.